United Nations Secretary General Ban Ki-moon will deliver a keynote speech at the International Olympic Committee session this week before the start of the Sochi winter Games, IOC President Thomas Bach said on Monday. 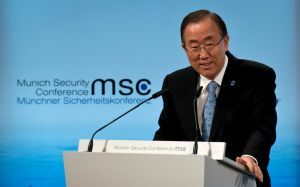 Ban would become the first secretary general to address the session, Bach said. The IOC has observer status at the United Nations. "The secretary general has accepted the invitation to attend the IOC session and deliver a keynote address," Bach told reporters in the Russian Black Sea resort of Sochi, where the Games begin on Friday. Several heads of state, including US President Barack Obama, German President Joachim Gauck and President Francois Hollande of France, will not attend the Games in what many see as a snub to Russia. The country has come under mounting criticism over its human rights record and the passing of an anti-gay propaganda law that critics say curtails the rights of homosexuals.